When Surveyor-General Colonel Light William first drew up plans for the city of Adelaide back in 1837, he included an area of 342 acres north of the Torrens River which came to be known as North Adelaide. North Adelaide remains one of South Australia’s premiere dining, shopping and residential districts, only a five-minute drive from the CBD or a 15-minute walk north of the Torrens River, passing the exquisite new Adelaide Oval. This picturesque suburb is full of tree lined streets, five-star real estate and manicured parklands, and scattered throughout you’ll find several heritage listed pubs bursting with charm from their original days of operation. We take a look at some of these beautiful, heritage hotels which retain their historical elements while offering modern day gaming facilities, providing some of the best atmospheres to play pokies in South Australia. The Oxford is an icon of North Adelaide as one of the few heritage-listed pubs remaining. Built in 1884 by architects Daniel Garlick and Rowland Rees, the Oxford Hotel building was originally established to be a combination of part hotel, and part the National Bank of Australia, taking over the Princess Royal Hotel which previously occupied the site. The building design was one of the most advanced and original of its kind at the time, unique because it didn’t include a balcony or veranda as was typical for hotel designs in the late 1800s. Situated in the heart of O’Connell Street, The Oxford Hotel remains an iconic part of North Adelaide’s history. If high ceilings and original floorboards are your thing, you’ll instantly fall in love with this old yet stylish pub, with a huge front bar which commands the space between the entranceway and dining room. 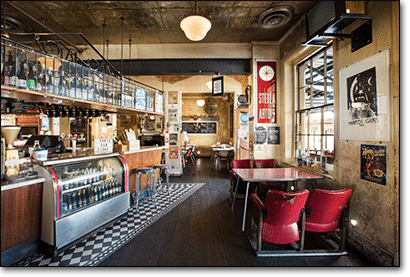 Although recently renovated and revamped to appeal to a younger crowd, The Oxford will forever maintain its place as one of South Australia’s most iconic heritage listed pubs, standing proudly on the corner of Tynte Street and offering alfresco seating on both the Tyne Street and O’Connell Street sides. Enter via Tynte Street and you can head directly into the large gaming room, which you’d never guess was part of such an old building. Here you’ll find plenty of pokie machines to keep you entertained, with tea and coffee facilities available, or simply head out to the bar to enjoy the tasty new menu containing pub classics and on-trend American/Asian fusion. Specialising in beer crafting with a pokies area to boot – perfect. The Royal Oak is a laid back hotel with exposed brick walls, retro furniture and a newly added backyard beer garden. This pub is bursting with character, using its historical position as the inspiration for every aspect of its design and hospitality. The eclectic bar attracts all kinds, from trendy city folk to laid back punters, with live music in the bar most nights of the week. Specialising in craft beer and offering brews from some of South Australia’s finest boutique breweries, customers can choose to spin the Beer of Fortune to help decide which new beer to try. So strong is the historical personality within the walls of the Royal Oak you would never guess at the back of the building lies a large, newly built pokies and gaming lounge, arguably the biggest in North Adelaide. While there’s nothing historical about the pokies area, punters can still enjoy the warm hospitality of the Royal Oak, while stepping into the front bar for a delicious pub meal or coffee anytime. The Royal Oak is part of the Monty’s Rewards program, where members can earn points when playing the pokies or spending cash at the pub, which can then be redeemed for food and beverage discounts. A unique gaming venue with origins as a brewery turned popular dining and drinking venue. Originally operating as a brewery, The Lion Hotel is one of the biggest and busiest pubs in North Adelaide. The building was designed in 1872 by architect Daniel Garlick (who also co-designed The Oxford) with the intention of running a 5” X 25” underground cellar, with a malt house of the same size operating above along with the brewery and storefront. The brewery underwent several alterations over the following years, before the hotel was developed at the front on the corners of Melbourne Street and Jerningham Street. The Lion Brewing & Malting Co ceased operation in 1914, continuing to produce soda waters and cordials for a while before operating purely as a hotel. The Lion Hotel is largely the same in construction today as it was in 1883, although its undergone many internal renovations to keep it up to modern-day scratch while still retaining plenty of its original charm. The original cellar and adjoining tunnels can still be hired out for private events, making them one of Adelaide’s most unique function spaces. Along with multiple dining areas and bars, The Lion houses gaming facilities, making this pub one of the most historically rich buildings you can play pokies within Adelaide. Where else can I play pokies in Adelaide? 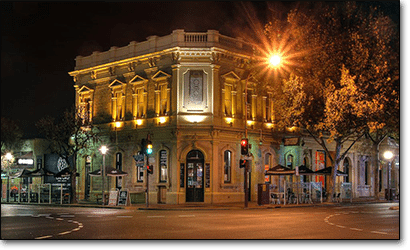 Other historical pubs around North Adelaide include The Archer Hotel, The Cambridge Hotel, The Daniel O’Connell Hotel, The British (which is Adelaide’s second oldest pub), The O Hotel, The Cathedral Hotel, The Kentish, The Queens Head Hotel and The Caledonian. Wherever you are in North Adelaide, you’re never far away from a frosty cold pint of craft beer, a tasty pub meal or a quick spin on the pokies. Industry professionals from Asia Pacific will converge at the 8th annual Gaming, Racing and Wagering Australia (GRWA) conference in Sydney the 14 to 16 August.